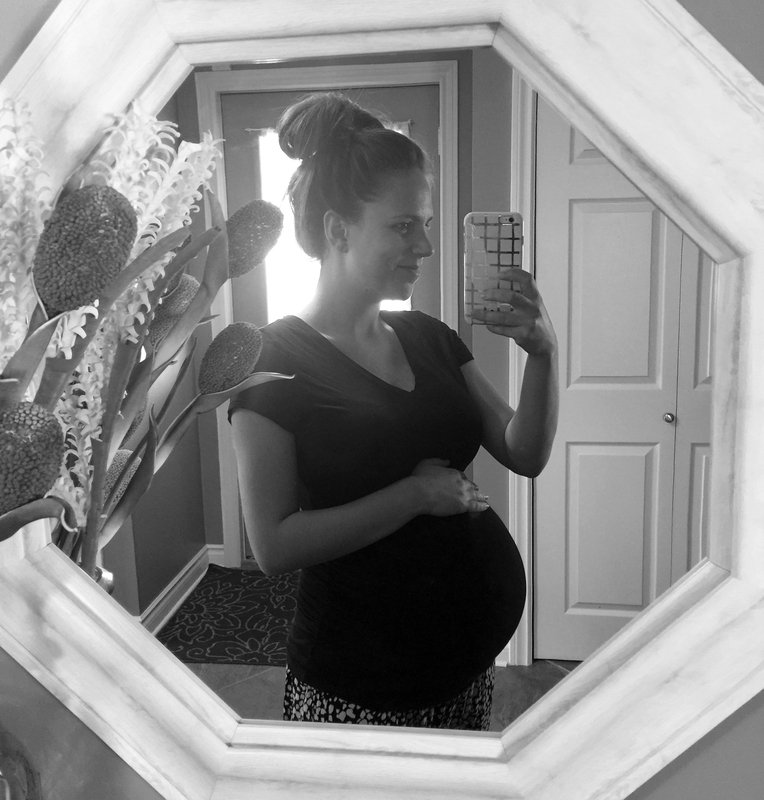 Since it is my last week of pregnancy, I figured I should make one last bumpdate on the blog before our baby girl arrives! I still can’t believe that we are at the end of this pregnancy journey. It has been one crazy adventure and boy am I ever glad it is over! I just can’t wait to have a daughter and to begin the next chapter in our lives! Parenthood is going to change us forever, and to me that is the most exciting thing in the entire world! So here is it, once last look into my pregnancy. Thank you guys for following along with me, and I can’t wait to introduce you to our girl in the coming weeks! How far along: Past due! 40weeks & 4days pregnant! Baby’s size: Anywhere from 6-9 pounds, although my doctor did predict somewhere around 7! Also, my baby app tells me the size of a watermelon. I’m feeling: Super impatient. It is so hard to just wake up every morning wondering if it’s the day that you are going to have a baby. The good news is if she doesn’t come before Friday we are schedule to be induced bright and early, on Friday the 13th. (Good thing I’m not superstitious!) Having an actual date definitely makes me less anxious. Symptoms: Most of my symptoms occur in the evening/at night. I still get heartburn every day and it usually interferes with my sleep. I am having a ton of Braxton Hicks contractions. Baby is still moving around in there like crazy, but she is running out of room. Instead of kicks, I feel more of her stretches. Also, she has dropped a lot in the last few weeks, which my ribs are thanking her for. Food love: Milk, milk and more milk. I am completely obsessed. And the strange thing is I HATED milk before I got pregnant. Like I actually used to think it was gross that someone would just sit down with a big glass of milk lol. I drink it skim with ice cubes to keep it extra cold. Chocolate milk is also on the list. Plus, I went through a weird Sour Cherry Blasters craving… oops. Food hate: Not really hating anything. I try to stay away from foods that cause more heartburn though. Currently living in: My husbands pyjamas, the 3 tops that still fit me, and the tight maternity jeans that I can’t stand to wear anymore. Basically I have absolutely nothing to wear, and I cannot even begin to express to you how excited I am to wear normal clothes again! Looking forward to: Finally meeting our daughter!!! Who knew that you actually would beg to go into labour at this point in the pregnancy. Let’s do this thing!